Real Madrid are set to smash the world transfer record after agreeing a deal worth €180million to sign Kylian Mbappe from Monaco, according to latest report in Spain. Madrid-based newspaper Marca claim that the Spanish and European champions have struck a deal that would easily eclipse the world-record sum of €105m that Manchester United paid to Juventus to sign Paul Pogba last year. Madrid will pay €160m up front and at least a further €20m in add-ons relating to Mbappe’s success at the Santiago Bernabeu, it is reported. The France international is expected to sign a six-year contract that will see him earn €7m per year. Monaco had always appeared resolute in their determination to keep Mbappe despite speculation linking him with teams across Europe. The Ligue 1 champions threatened to involve FIFA after accusing unnamed clubs of making unauthorised approaches for the forward in recent weeks. It is said that head coach Zinedine Zidane has given the green light to the transfer after expressing concern at his lack of options in attack, with Madrid having sold Alvaro Morata and Mariano Diaz to Chelsea and Lyon respectively. 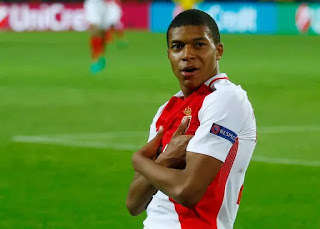 Mbappe registered 26 goals and 14 assists in all competitions last season as Leonardo Jardim’s side claimed the league title, reached the final of the Coupe de la Ligue and the semi-final of the Champions League. Monaco have lost a number of stars since the end of last season, with Bernardo Silva and Benjamin Mendy joining Manchester City and Tiemoue Bakayoko signing for Chelsea. Thomas Lemar has been linked with a move to Arsenal, meanwhile, and Fabinho has also been tipped for a transfer.